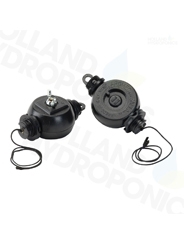 Our range of grow room lighting accessories includes everything from chains and rope ratchets, spare plugs, extension leads, kettle plugs, light meters and heat shields. 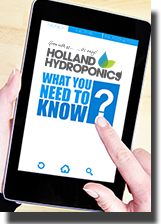 Keep your grow room running smoothly and your grow lamps working at their optimum level at all times with these lighting accessories. These strong and robust IEC kettle power leads measure 6 meters in length and come fitted with a UK 3 pin plug and 13 amp fuse. Replacement 1000w lamp holder for the Adjust A Wing reflector, features an E40 lamp fitting, a heavy duty cable and is suitable for 1000w HPS and MH lamps. The Dimlux Expert Series complete system is a new arrival to the indoor Hydroponic gardening division. This new unique innovation is second to none and is taking the indoor lighting market by storm! These Rope Ratchets are the perfect accessories to hang light fixtures, carbon filters and extraction fans at the perfect height in your grow room. Supplied in packs of 2, they're easy to use and will hold up to 68kg. Simple, easy to use and value for money Easy Gliders help you control the height of your lights. The newest suspension system for hanging your reflectors. High quality electrical cable available in 2 core and 3 core that's supplied by the meter. Useful if purchasing an RVK extraction fan that isn't supplied pre-wired. 2m 13 amp extension lead with either 4 or 6 plug sockets. Perfect for when your power sockets are just too far away or if you need extra plug space.